In an interview with Sky Sports, Nigel Stepney has been handing out the hints again. One grows a little tired of his references to inside knowledge that is never revealed. We are all aware that he knows more than is on record but I begin to suspect that his main concern is to escape retribution for some very foolish acts. It is true that the FIA has some explaining to do over its actions leading up to the movable floor controversy but there is also no doubt that Stepney went beyond stupidity in handing over the Ferrari dossier to Mike Coughlan. It matters not if Coughlan just kept the dossier without asking, as claimed by Stepney; the act of giving it to the McLaren chief designer was an illegal act, regardless of its motivation. The whole business of "getting a team together" to approach another potential F1 employer is nonsense too. Stepney and Coughlan may well have wished to present themselves as a package deal to Honda, but two guys working for different companies do not a team make. To me, it seems more likely that Stepney wanted Coughlan with him at the Honda meeting merely to add credence to his credentials as an engineer; to vouch for his qualifications, in other words. This would fit with Stepney's failure to do the obvious thing and resign from his Ferrari position. It can only be that he had so little faith in his ability to be attractive to another employer that he needed to get another job offer first. You and I may have felt the same need for security in our careers but then we have never been able to say, "I was Michael Schumacher's chief mechanic." That, surely, is enough for any F1 team to be interested. I can only presume, therefore, that Stepney is lacking in self confidence. That should not surprise us; there is no stipulation that anyone involved in F1 should be a psychologically sound personality. All that matters is that they do their job as well as or better than anyone else in the same position. Far from his not being responsible for what happened to McLaren, it may be that this character flaw in Stepney is what caused the whole sorry business. 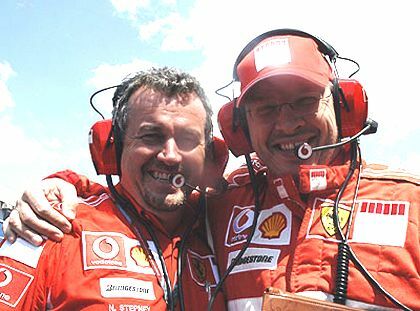 Since Stepney was announcing his dissatisfaction with Ferrari as far back as September 2006, it can only have been his fear of unemployment that kept him from leaving their employ at the time. Being forced, as he saw it, to carry on until an alternative appeared would have inevitably created the resentment that led to his striking back at his employer in the way that he did. Which is not to say that I disbelieve the few details of events that Stepney has released to the media. His explanation of events behind the moving floor saga are quite plausible, especially as the FIA has pointedly failed to produce evidence to the contrary. But much of Stepney's other utterances come across as a small man attempting to avoid responsibility for his acts. And to say that he was not sure he wanted to stay in F1 anyway is perhaps the most pathetic of his statements. That was hardly uppermost in his mind when he went to Nick Fry looking for a job. I will read Stepney's book when it eventually appears - after all, I am human and enjoy a bit of muck-raking as much as anyone. But I will take it with the proverbial pinch of salt, trying to sort out the truth from the excuses. Hi. Dan's was a lot of fun. Thanks. Love and peace. Help me! Help to find sites on the: homeowners insurance lead. I found only this - Colon cleanse parasites. The bureau of insurance regulates the insurance industry through examining and liability insurance coverage to you unless you have a lead safe certification. Atterholt to iurc, cutter to lead department of insurance insurance law podcast. With love :mad:, Calder from Mozambique.